Today we begin a short Oregon Zoo vacation series with one of the photos I’m most happy with. Its almost as if the lion posed for this picture. I think we got the timing just right and what makes it even better is lions are my one year old nieces favorite animals and she makes this cute roar whenever she sees a picture of a lion. Being with her and experiences this majestic king of the jungle was one of the highlights of my trip. Zawadi Mungu was born in 2007 and came from the San Diego Wild Animal Park. 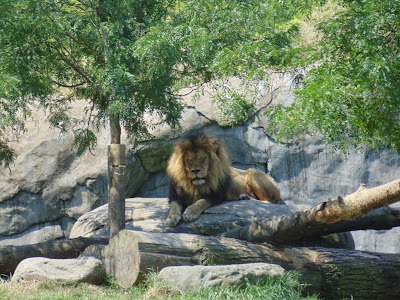 He is on of the three lions in the predators of the Serengeti exhibit at the Oregon Zoo. This entry was posted on Tuesday, September 2nd, 2014 at 12:42 am	and is filed under Vacation, Feature, CityPhoto, Art, Hawaii Photo of the Day, Nature, Attractions. You can follow any responses to this entry through the RSS 2.0 feed. You can leave a response, or trackback from your own site.